You are going to need a box of Kleenex for this story. In 2000 electrician Roza Katovitch suddenly lost her fiance to a heart aneurysm. Three days later her father died. This sent Roza into a tailspin which led to depression and eventually homelessness because she was not emotionally able to work. Every day she would go to the cemetery where both men are buried to tend to their graves. And she would be there all day long. She got to know the animals who came around. There were skunks, birds, raccoons and of course, feral cats. 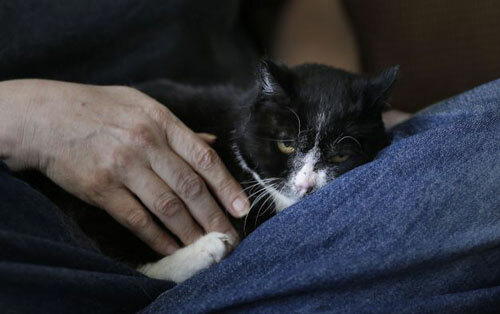 Carolyn Jones staff writer for the San Francisco Chronicle will tell you the rest of Roza’s story in this article which ends well for Roza and Miss Tuxedo the cat, with great photos. And yes, we noticed that her last name is KATovitch! Cats must be her destiny! The following article on new developments for the dreaded disease Feline Infectious Peritonitis (FIP) was posted to a Siamese cat group online earlier this year. What you’ll learn is that cats can get this disease when their immunity is compromised. FIP has meant death sentences for many cats. Now there’s hope for this diagnosis. If a Dr. Jekyll-and-Mr. Hyde type of disease in cats ever existed, it’s feline infectious peritonitis (FIP), a deadly mutation of the benign feline enteric coronavirus (FECV). FIP is difficult to diagnose, rarely treatable and nearly always fatal. FIP takes two forms: a fast-progressing wet form, causing fluid accumulation in the abdomen or chest, and a non-effusive dry form in which inflammatory lesions develop on major organs. Dry FIP progresses slower and is especially difficult to diagnose; signs include neurological, eye, kidney and liver disorders. Traditionally, treatment for either form is merely supportive. But FIP researchers are pressing forward, investigating ways to block FECV from mutating, improve feline immune responses and find genetic clues in cats or in the viruses that will enable earlier diagnosis. One previously experimental medication is now used off-label by veterinarians to treat non-effusive FIP. Other researchers are studying immunosuppressive and antiviral drugs. The biggest FIP research success comes from Legendre’s study of polyprenyl immunostimulant (PI), a drug that has controlled the dry form of FIP for one year or longer in approximately 30 cats. In his three-year clinical study, Legendre treated 58 cats diagnosed with non-effusive FIP, and, subsequently, he has consulted with veterinarians to treat many more patients. One of the cats in Legendre’s pilot study is still healthy after eight years on PI. (See sidebar.) Once started, PI treatment must continue or the disease will return. Inadequate Immunity Intestinal FECV is common in cats, especially in multi-cat environments, and causes only mild illness. But laboratory studies suggest that in an estimated 20% of infected cats, FECV transforms into its evil alter ego, the malevolent FIP virus (FIPV). Researchers now believe that cats with healthy, strong immune systems can fight off FIPV, but cats with impaired immune responses cannot. “Even though almost all cats will be exposed to coronavirus [FECV] during their lifetime, most will lose the infection,” says Niels Pedersen, DVM, PhD, who has studied FIP since 1964 and is the director of the Center for Companion Animal Health at University of California-Davis. “FIP is mainly a disease of young cats, with the highest incidence between 4 and 18 months of age,” he says, when immune systems are still developing. Only some cats have the genetic traits and immune deficiencies that allow FIP virus to develop and spread. In those cats, FIPV hijacks the immune system’s white blood cells, turning them into virus factories and causing deadly inflammatory responses. “Lots of animals have their own coronaviruses, but FIP only affects felines and ferrets,” says Gary Whittaker, PhD, professor of virology at Cornell University College of Veterinary Medicine. “Some cats’ immune systems fight it off, but some cats can’t, especially younger cats or ones who are immune compromised.” Boosting Immunity Legendre says cats with FIP have poor cell-mediated immunity – they lack enough T-lymphocytes, super-killer immune cells that are necessary to fight viruses that invade cells and replicate within them. Legendre presented his research at veterinary conferences in 2012 and 2013, and expects to publish a paper this year. His studies report no benefit using PI for wet FIP. But PI also treats viral rhinotracheitis, for which the USDA granted it conditional licensing in October 2012. PI is now available to veterinarians through VetImmune.com. When cells produce protein, necessary for the growth and functioning of all cells, they copy that protein’s DNA onto a messenger RNA molecule. Not all proteins are needed all the time, however. The body naturally stops protein production with microRNAs, smaller molecules that can target specific messenger RNA for destruction. SiRNAs work like microRNAs. “We are redirecting the cellular machinery to specifically attack the virus,” Wilkes says. “Normally this machinery is functioning to turn off and on the cell’s own protein production.” Her next goal is to genetically alter blood stem cells so they manufacture siRNAs internally. Someday, she hopes siRNAs will travel the blood system fighting FIPV. A Highly Mutable Virus FIP is not considered transmittable, but FECV is highly contagious and prone to mutation. At Cornell, Whittaker is studying the molecular structure of the FIP virus to uncover genetic differences between FIPV and FECV. He hopes to eventually develop a diagnostic blood test and ultimately, perhaps, an effective FIP vaccine. “Now, because FIP is being diagnosed late, even if you had a good therapy, it wouldn’t have time to work,” he says. His research focuses on proteases, protein enzymes on cell surfaces, which may allow FIPV to penetrate white blood cells and spread systemic infection. He believes FIPV is constantly changing, related to an individual cat’s genetic and immune traits. Another possibility is that an as-yet unidentified type of FECV might be more prone to mutating into FIPV than others. “That may explain the outbreaks of FIP that we see, but it’s just one idea,” Whittaker says. Identifying Genetic Causes At UC Davis, Pedersen is studying the DNA of cats to identify the multiple genes affecting a cat’s resistance or susceptibility to FIPV. His ongoing research with Birman cats suggests that genes in at least five regions of the genome may influence disease resistance in that breed. But finding the precise, causative genes is a long way off. “Our study was an initial attempt to push into the area of complex genetic traits,” he says. “What we found for Birmans, even if it can be confirmed, may not apply to other breeds or to random-bred cats.” No one knows how many or which cats exposed to FECV will develop FIP, he adds, because in addition to genetic factors, susceptibility to FIP infection depends on the cat’s age, level of exposure, health, diet and stress, such as living in a shelter environment. “What we can say is that the FIP mutation is very common – maybe it even occurs in 20% or more of FECV infected cats – but if the cats are normal, very few of them will actually get sick,” he theorizes. In 1971, Pedersen received the first FIP-related research grant given by the Winn Feline Foundation, of Hillsborough, N.J. But today, his work is only one of many FIP studies funded by organizations, corporations and individuals supporting research to prevent and treat this tragic disease. Fran Pennock Shaw is a multi-award winning freelance writer from Lancaster, Pa. She is past president and past treasurer of the international Cat Writers’ Association and author of Gotta Love Cats, published by Barron’s Educational Series Inc.
Bixbi Pet Superfoods – 20% off for newsletter readers and Facebook followers only – 72 hours only! During Spring and Summer we think about rejuvenating and feeling better for ourselves and for our cats. For the next 72 hours medicinal mushroom based Bixbi Pet Superfoods are on sale at 20% off! Sale ends Thursday June 12th at 7AM Eastern. 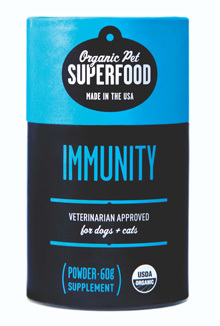 So easy to use, just add the powder to your cat’s food. I used to thread the seat belt through the handle of a carrier thinking that if I was in an accident the cat in the carrier would be perfectly safe, that it might jerk, but it would stay in place. Was I ever wrong! In this video you’ll see what happens to the seat belt at the moment of impact! It is shocking. You don’t need to understand German to see what happens in crash tests, the visuals say it all. We could not find an English language video on the subject. This video shows us that the best way to transport your cat is in a carrier placed on the floor of the back seat. This video is suitable for people of all ages, there isn’t anything scary or tragic, it’s 100% crash tests with dummies and mannequins. FREE SHIPPING Today June 3rd! Get free shipping today on everything we sell – including Comfort Zone with Feliway and Anti Icky Poo urine cleaner – everything!